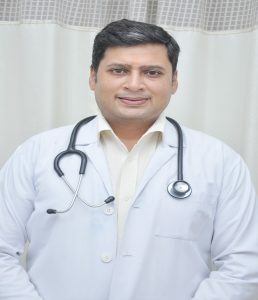 Dr. Neelesh Bansal , MS , from premier institute of Punjab, DMC and H.He has more than 17 years of experience. Training from Sr. Ganga Ram Hospital under Dr.P.K. Chowbey added finesse to his Laparoscopic technique. Main areas are : Laparoscopic Cholecystectomy Lap appendicectomy hysterectomies , TURP’s for prostate etc. His strong points are gentle nature, ability to listen patiently and quick diagnosis. Regularly attends conferences at national and state level besides life member of all surgical societies to keep himself updated with the techniques.